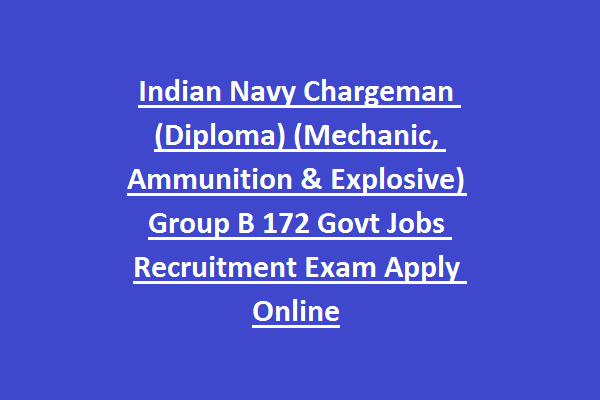 total 172 Chargeman vacancies available in Naval Dockyard, Mumbai. Eligible candidates can apply online using the website www.hqwncrecruitment.com/. Last date for submission of application form online is 28-04-2019 till 05:00 pm. The selection for this Indian Navy Chargeman Recruitment 2019 will be based on Written Examination. Category wise vacancies, Educational qualifications, Age limits, Exam Syllabus and Pattern, Pay scale of Indian Navy Chargeman Naval Dockyard, Mumbai are given below. 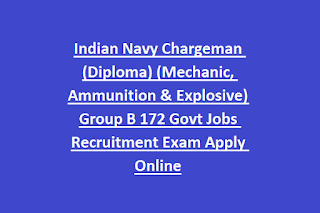 Click here to see the official advertisement of Naval Dockyard Chargeman Recruitment. Opening date of online application process: 16-04-2019. Closing date of online application process: 28-04-2019. There are total 172 vacancies available in Indian Navy Recruitment. For Chargeman Mechanic: Candidates must completed Diploma in Mechanical/Electronics/Production/Electrical Engineering rom recognized University. For Chargeman (Ammunition & Explosives): Diploma in Chemical Engineering from recognized University. Upper Age limit of the candidate is 30 years and Minimum age limit is 18 years as on closing date of receipt of online application. Age Relaxation for SC/ ST is 05 yrs, For OBC candidates is 03 years and 10 years for PWD candidates. Applicants will get Pay Scale of Rs. 9300/- to Rs. 34800/- Plus Grade Pay Rs. 4200/-. Selection for this Indian Navy Chargeman recruitment is based on the performance in Written Examination and Merit. Written test consists of 100 objective type questions in both English and Hindi languages. Syllabus for written test: Diploma in Engineering/ Management Skills/ General Knowledge/ General English. Exam Date: Applicants are requested to check www.joinindiannavy.gov.in regularly for Exam date, venue and other recruitment updates. Interested/ Eligible Jobseekers can apply through online from the website @www.joinindiannavy.gov.in. Online application link will be active on 16-04-2019. Before filling the form read the information guidelines from the notification. Fill the details and submit before last date. Take the printout of application for personal record and bring one copy of application form and admit card to the Examination center. Closing date of online application procedure is 28-04-2019 from the date of publication of the advertisement.